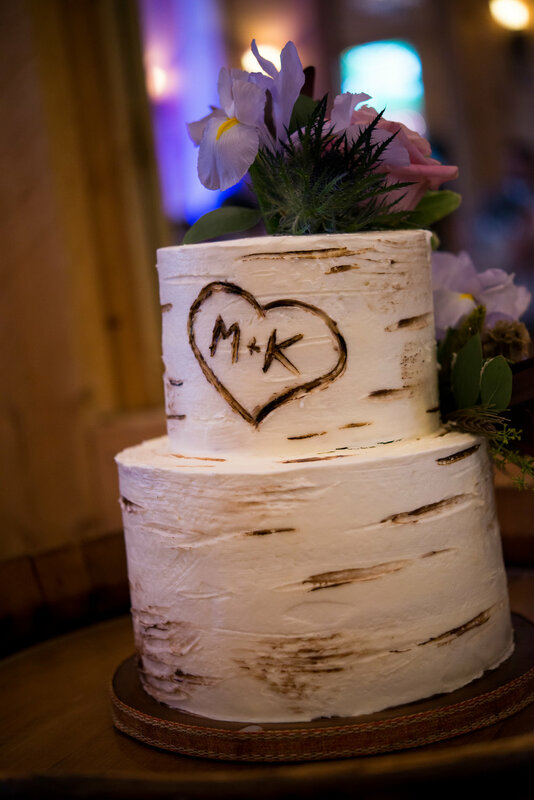 Kirsten and Michael hosted their Colorado wedding at Crooked Willow Farm in Larkspur (just south of Denver!) When searching for venues, Kirsten and Michael wanted "a venue that embodies everything that is epic AND classy!" With Crooked Willow Farm, they TOTALLY nailed that vision. Crooked Willow Farm is a huuuge immaculate and amazingly gorgeous barn set in the middle of beautiful pristine Colorado fields. Kirsten grew up owning horses, so when the venue came equipped with camels onsite, horse barns all over and tons of little equestrian detail she knew it was the perfect place for her and Michael to get married. The couple continued to embody their rustic (yet super epic and classy) vision with a combination of timeless and elegant details. Kirsten's bridesmaids adored cowboy boots, while Michaels groomsmen had boutonnieres in shotgun shells (and featuring pheasant feathers!) Their stationery suite was custom designed with real gold foil, handmade paper, a raw leather wrap and the most beautiful hand calligraphy ever. Kristen and Michael intentionally put their own touch on their wedding by focusing on the little details - their guests noticed and loved the personality they felt in the overall decor. After the ceremony, Kirsten and Michael signed their marriage license and spent some time with Ladyhawk. Their guests sauntered into the courtyard to enjoy a custom cigar-rolling bar, whiskey tasting, sausage station with elk, lamb and wild boar (whaaaat! ), wine tasting and a string quartet for ambiance. Epic and classy! The night concluded with a custom curated dinner (and dessert) from Occassions Catering, a mass of heartfelt toasts, tons of great dancing and one of the best father/daughter dances to date. Everything WAS epic and classy for Kirsten and Michael! From the amaaaazing drapery and lighting in their reception, to the jaw-dropping florals and arbor piece (peacock feathers, antlers, garland!) It was truly one of our favorite weddings we have been apart of in Colorado! * From their Lead Planner, Taylor: "Kirsten and Michaels wedding was absolutely and forever unforgettable! It was so much fun to work with Kirsten from the beginning. Together, we found her venue, designed her moodboard, curated her lookbook and set her vision on fire! By intentionally collaborating with amazing vendors we made her vision come to life, all of the vendors were perfect for what Kirsten wanted! My favorite part (aside from her walk down the aisle on the horse) was the room reveal! Showing Kirsten that her vision HAD came to life made us both tear up ~ happy tears! It was everything she wanted, and as a planner that is all you can ask for! SO much fun planning this wedding, I wish we could rewind and do it all again!"